This entry was posted in CA Collection and tagged 1, Business Car, Passenger Service. Bookmark the permalink. The car is parked on the business cars storage track at Springfield / Kansas Avenue / West Yard. This track was on the north side of the yard, west of the Springfield Diesel Shop, east of the shops power house and water tower at the West Shops. The track was just east of center, near the middle of the yard bowl. To the north (left) of the car on the adjacent storage track is the boom and pile driver head of a rail crane. The boom and head are cradled above a 65’ gondola. The gondola is painted silver in recognition of its use in company maintenance of way (MOW) service. In the distance to the east (right) is the west end of the Springfield Diesel Shop. On the southwest corner of the shop is the Diesel Parts Storeroom. 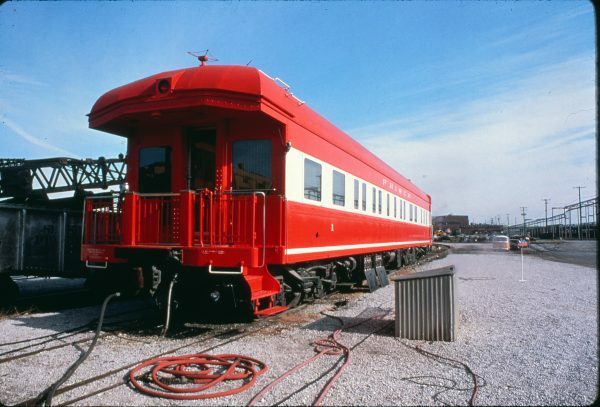 It had two tracks on its north side to support receiving and shipping parts and materials. On the south track in addition to box and flat cars, on occasion gondolas were positioned that were loaded with scrap metal and waste from the wheel lathe. Truck mounted wheels under locomotives were turned on the lathe on track 9. This would true up the wheel tread to remove flat spots. Metal shavings were removed into dump trash bins. These were then moved by forklift to the stores dock and poured into gondolas to remove the oil soaked metal shaving scrap. The north stores track was used to load tank cars with waste fuel and lubricating oils reclaimed during locomotive maintenance. A small pump house and basement storage tanks held the fluids until loading. In this view locomotives are temporarily stored on these tracks awaiting their turn in the diesel shop. Two additional tracks out of view further north are entered the diesel shop from the west side. Track 9 on the far north side was the first through track in the shop. Centered along its length, under this track was the wheel turning lathe. Track space on either side of the lathe permitted a locomotive to be repositioned to work any axle on the front or rear truck. A track extension and metal building addition in the mid-1970s added a new through track on track 8. This became the system scheduled running spot inspection and maintenance track. The track was divided into six total spots. One outside (the Zero (0) Spot) and five indoor spots (Spots 1, 2, 3, 4 and 5). Fuel tanks and trucks were steam cleaned outside at the Zero Spot. Once moved inside, the Spot 1 was locomotive shut down, air, fuel and oil filter replacement and oil change. Spot 2 was car body interior and exterior washing by hand brush. Spots 3, 4 and 5 were short term maintenance and service of various locomotive electrical, mechanical and pneumatic components. All of the short term maintenance and service was driven by system reports based on the periodic sampling of locomotive fluids in the railroad’s Springfield Labs and reports from locomotive engineers and service track personnel. To the south are the elevated steam, return water and air lines north of the yard bowl.